AV Equipment Rental in Barcelona. Because of our experience we are the ideal av company for your event. We offer audiovisual equipment rental to cover the technical requirements of your conferences, gala dinners, product presentations, or company meetings in Barcelona: All your audio visual installation requirements are catered by our outstanding AV technicians to guarantee a total success in your event providing the installation that fits your needs. If you are a business-owner or entrepreneur, you know that today’s world is all about innovation and surprise even on the smallest of scales. Making the occasion special by adding subtle or eye-catching details can make your product go viral, attract new products or even gain the admiration of your competition. That is why hiring audiovisual equipment for your events or conferences is the best way of showing off your creativity and standing out from the crowd. Imagine your stand at the next exhibition attracting visitor upon visitor thanks to a lighting display, an interactive video or even neuromarketing; one of the newest up-and-coming corporate trends. You will win respect and give your brand the attention that it deserves with the best support. At EB we know the importance of surprise in an ever more competitive and open-minded world. We have many years of experience in event management and aim to provide an added value that seduces an audience with a fitting display. So, when talking about an event or conference, the right choice is vital when searching to hire audiovisual equipment in Barcelona. But you don’t need to worry. We have a team of professionals who will meet your every need, suggesting the best possible options and making your event better than you or your team ever imagined, and one that surpasses all expectations. Are you starting to imagine your future stand? If you already know that innovation and surprise are now part of the corporate landscape, EB is going to make life even easier for you. 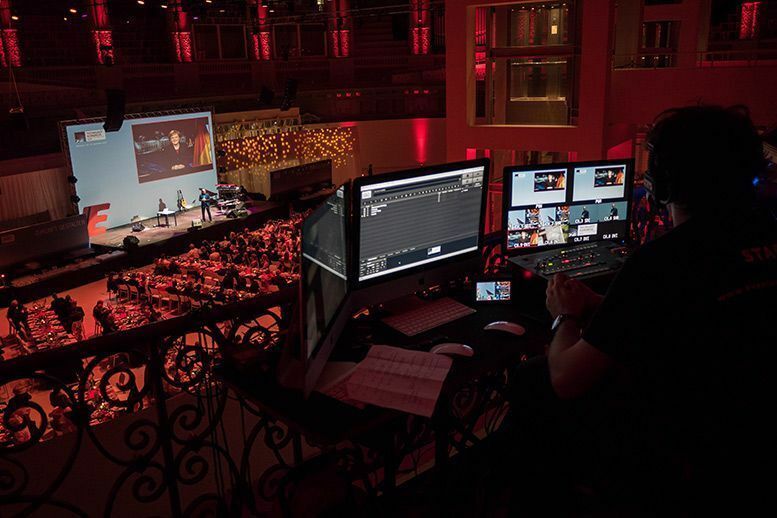 We don’t just have an extensive catalogue of audiovisual equipment for hire in Barcelona, but we also take care of the setting-up, the organization and we even offer creative ideas that perfectly combine with the requirements of the event organizer. You just need to let us know what your ideas are, ask us some questions and choose the audiovisual equipment to lead you to success. Do you want to hire audiovisual equipment in Barcelona? Come and find out more.